Watch the benefits of PumpHD! PumpHD is the most advanced way to directly impact consumers while they wait for vehicle fueling. 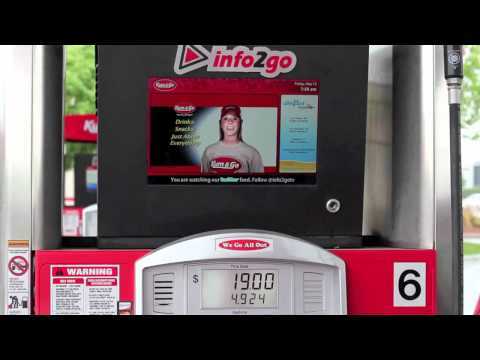 The system mounts on top of the fueling dispenser to display information and promotional messages. By using the power of video the system entertains and informs consumers during an otherwise idle time. Great visuals combined with reinforcing audio allow products to be show-cased in a way that impacts sales immediately. Info2go has incorporated industry-leading display technology that combines high bright LEDs, optical bonding and high performance glass. It’s a high definition display that is truly sunlight readable. PumpHD is the first pumptopper ever to integrate the use of security cameras. Securely access the captured camera content instantly from any internet connected computer. PumpHD receive content using wireless communication making installation a breeze. Using the PumpHD Cellular Connect Package allows install without even entering your store!